It sure ain't easy keeping tabs on our ever-expanding list of swoony must-have jewels, accessories, and clothes—especially for fall!—which is why we're prone to indulging in some DIY to get the look we're craving for less. But for Erica Domesek, a New York City-based lifestyle, design, and style expert, DIY-ing has become an obsession manifested in her crafty chic blog P.S.—I Made This. Driven by the mantra "I see it, I like it, I make it," Erica has garnered plenty of followers, including Vogue Nippon and GQ. And her latest challenge? To grant our wish and re-create a few of our favorite new accessories…yep, three ways to take a bit of craftiness and channel it into full-blown fall '09 fashion! How to: 1. Place a piece of cardboard (some tights come with it) inside each leg. The cardboard will prevent both sides from sticking together, and will also stretch fabric to work on. 2. Use a super duper strong fabric glue to smother small areas on tights. 3. 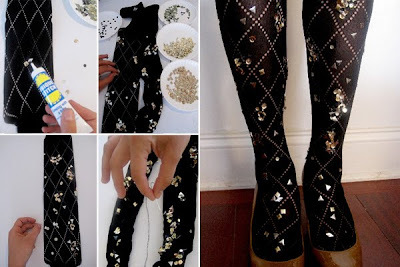 Cluster sequins on top of glue and spread all over the surface of the tights. Feel free to layer on top of one another for a more three dimensional effect. If you have any sequins or broken mirrored jewelry lying around, use them. Traditional sequins aren't the only option for tights—get creative! 4. Once dry, reinforce sequin clusters with a needle and thread. 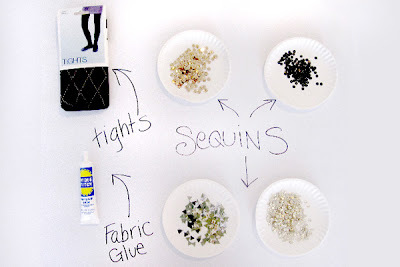 Use similarly colored thread to blend in with tights and sequins. Sequins and fabric glue available at M&J Trimming.